A good news to PrestaShop owners who are looking for "Quantity Discount Indicator" which can display lowest available price of same product. Agile Quantity Discount Indicator is just released. 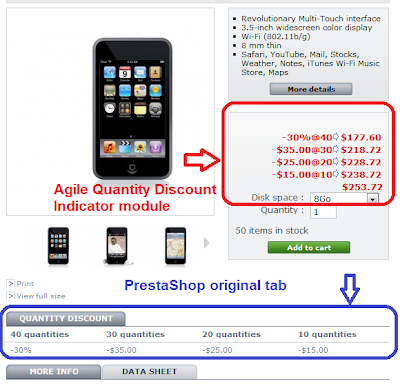 Yes, PrestaShop itself also provide a tab at product detail page that display Quantity Discount. See below image that compares Agile Quantity Discount indicator and PrestaShop quantity discount tab. Obviously Agile Quantity Discount indicator is much easier for user to understand because it displays detailed information include final price after discount. Further more, Agile Quantity Discount indicator is able to lowest price of the product at other places like Home featured products, category and search result list.